Sewanee, Tennessee is one of the most beautiful places in the South. Although I’ve only left the South twice in my life, were I better traveled I’m sure I’d say it was one of the most beautiful places in the entire world as well. Every time Mama and I drive through this town or walk along the mountain trails its as if our daily stresses are leached directly from our souls. There is a peace here that I’ve not found anywhere else. I think the town realizes the value of that peace in how they preserve the natural landscape, burrowing structures among the trees and hills rather than mowing them down to make more room. Even though the famous University of the South is located there, folks have still found a way to keep their heads on straight when it comes to tradition and values. My first visit to Sewanee was over fifteen years ago. Mama and I try to go there once a year for a quilting retreat at St Mary’s, (although I’ve regretfully missed the last few years and will miss this one as well). We sit and sew, talking and chatting with friends and looking out the windows at what appears almost be too beautiful to be real. There is also a labyrinth at St. Mary’s that I enjoy walking. The last time I walked it was when I was trying to decide if I should have a second child (Katy Rose is the outcome of that). Mama and I always take time to walk along the trails, often times ending up at the entrance to the convent or the Templeton Library (which has a fascinating history to it, ask any native when you visit for the somewhat tragic inside scoop). We take time to visit our favorite gift shop in nearby Cowan, The Sampler, to pick up something pretty to bring back with us, and the little white tea room called The Corner House just across the street provides a perfect lunch. As we drive back up the mountain with its twists and turns we have to watch for the little turn off to go to a salt glazed pottery studio. I’m not sure if it’s still around but I think the name is Hallelujah Pottery. Mama has a beautiful vase she got from there and I hope to make it back soon to pick out a mixing bowl. From there we head on over to the township of Assembly once more to drive down the roads cut for carriages and visit the small community virtually untouched by time. Our days in Sewanee are long, relaxing, and reflective. In Sewanee, we haven’t a care in the world. With no thoughts even for dinner. As each meal time draws close all we do is simply wait for a smiling lady to step outside the kitchen door and ring the dinner bell. It’s amazing how spoiled you can become in just a few days. St Mary’s cooks are known for their simple and delicious food. This is where Mama first had this tomato soup and brought the recipe back to me. I’ve tweaked it a bit but I’m sure you’ll enjoy the outcome. I hope you try it soon and if you get a chance, do pay a visit to Sewanee. 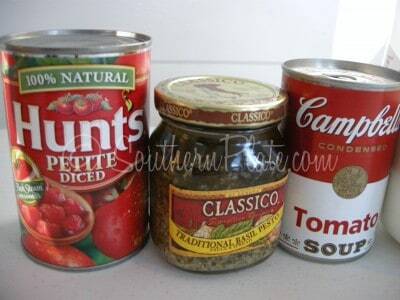 You’ll need: A can of petite diced tomatoes, a little pesto sauce, and a can of tomato soup. You’ll also need some milk. I’m using whole but you can use whatever is in your fridge. Pour soup into a sauce pot. 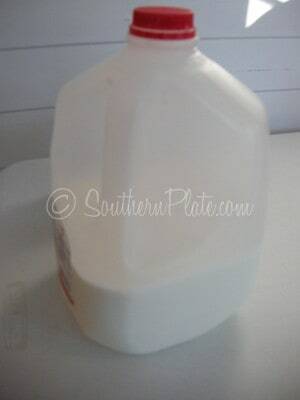 Fill up the soup can with milk and add that. 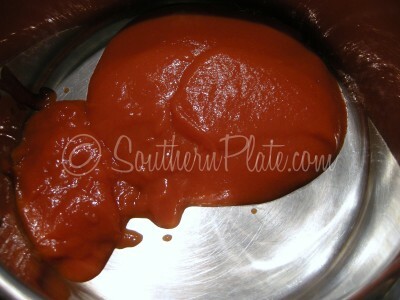 Pour in can of tomatoes, juice and all. Stir that up and heat over medium until heated through. Serve warm. Make it a complete meal by adding a buttery toasted grilled cheese. Take a deep breath and walk a mountain trail, if only in your mind. In sauce pot place tomato soup, tomatoes, and pesto sauce. 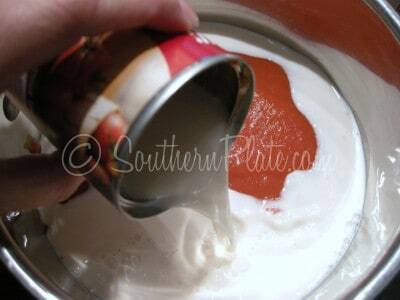 Fill tomato soup can with milk and pour that in as well. Stir and heat over medium until heated through. Enjoy! ~Confucius . Submit your quote here. It sounds like a wonderful place, thanks for sharing it with us Christy! And I want the soup…right now! I live in Winchester, which is in the same county as Sewanee and just a five minute drive from Cowan. It is such a beautiful place, especially in the fall. My husband actually proposed to me at the Cross on the Sewanee campus. I wanted to mention that I do not think Hallelujah Pottery is still in business, but I have been wrong before 😉 Hope you get to visit our little county again soon. The Soup looks yummy! Eventually I’ll go getting all poetic on Winchester, too! lol Your comment just brought even more beauty rushing back to me, you truly do live in one of the most beautiful places around! Thanks for letting me know about the pottery. Hopefully someone else will fill the void soon! Nice soup – simple and easy. Perfect for dunking a grilled cheese sammie in if ya ask me! You’re right. When I think beauty and relaxation, I think Tennessee. Just a glorious place, I’m longing for it now. I hope your weekend is wonderful too, Mary! There is a restaurant called “Crispers” here and they have a Tomato Bisque Soup that is killer! This looks quite a bit like it, but theirs has a little “bite” to it … manager says it has red pepper flakes … so I may add a little when I try your nice & easy recipe!! They serve it with croutons and shredded parmesan cheese. Thanks! Now you got me wanting to try this with them also. Let me know if you get to it first! Daaaang, Trish ……that sounds good for folks that like a little more bite to their food, like my honey-pie hubby does. I can fix the soup recipe just like “Super C suggests (since I cough/choke/cough with spicy food and Christy tried to kill me this summer at a BBQ restaurant) and then add some red pepper to his. Honey pie hubby looooves tomato soup w/ grilled cheese “sammiewiches” that takes him back to his childhood days. Thanks for a great recipe “Super C” and Trish for an extra idea too. I love tomato soup with grilled cheese tooooooo!!! I have never been to the Sewanee area but have enjoyed all of the other Southern place I have visited. I love the south. It always seems so laid back and comfortable. Not to mention beautiful. You make me wish I could go there again soon. This looks so good! 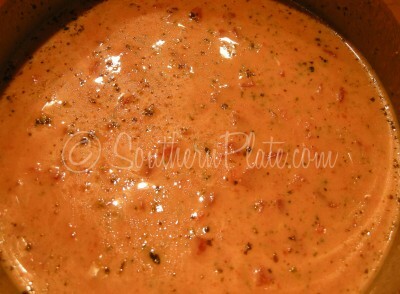 My tomato soup is very similar, but I add spinach too. I love Tennessee too, we eloped there like Mary, but in Gatlinburg. We were fortunate enough, on our Christmas vacation up their, that I-40 was closed through the park. So we got to see Johnson city, and Knoxville, and everything in between. I always thought I wanted to live up there, but now I think I’m just a Florida girl! When I first moved here to Orlando, everyone thought I was telling a fib, and I actually was from Tennessee, I wish. Orlando-ites are so, i dont know, isolated maybe, many don’t know about the culture of the Florida panhandle. They think the south starts at the Georgia and Alabama state lines, lol! It’s snowing like crazy here in Michigan! We’re expecting 4 to 6 inches of snow and this sounds like the perfect feel warm and cozy dinner for a night like tonight. I may make some parmesan crisps to go with it or just grab the Velveeta and make melty, grilled sandwiches. My son went to school there and absolutely loved it. We loved visiting him there. Also the “chapel” on campus is a must see, and Shennanigans is a fun place to eat lunch. Shennanigans!!! That is the place we always stop at for sandwiches and I couldn’t remember the name!!!! Thank you! Soup looks delicious! Thank you for sharing the warmth of this yummy soup and for “taking” us to such a beautiful place on this oh so cold afternoon here in CT.
What a word picture of serenity! The soup sounds wonderful also! What a peaceful and beautiful picture, I love it. Husband just asked the other day if I made any home made tomato soup base from his garden tomatoes this summer and I had to reply ‘no’ — this looks so good maybe I can get by with it instead? Will try it soon. Yum! I love tomato soup. Cambells is a great base for the soup. I remember several years spending a 10 day vacation in Texas during the month of July and the heat was just overbearing and as we headed back to Ohio and reached Tennessee it was such a breath of fresh cool air that we thought we had just entered heaven. The refreshing air and green mountains were stunning. I have since traveled through Tennessee many times and I always take pause to admire its beauty. YUMMM…good with some croutons in it, or with some nice crusty bread to dip in it (especially in this cold weather)! 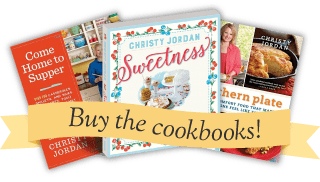 Mmm… tomato soup and grilled cheese sandwiches is my favorite comfort food meal! 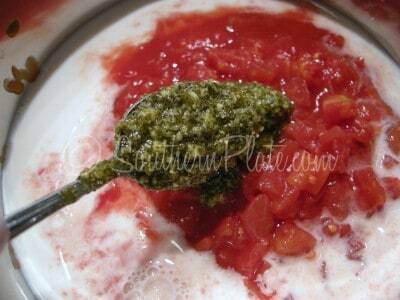 This is similar to the way I make my tomato soup but rather than adding pesto I always add some mild salsa. The hot variety would definitely give more “bite”. We lived for years in the Nashville area–still love TN though FL is my birth state. I feel like I’ve been to Sewanee just through Christy’s description. Sounds wonderful. You know I might even eat tomato soup if it looked like that!! The stuff out of the can really turns me off. Maybe fixin’ it up a bit will change my mind. That looks so good! A simple soup with a simple piece of bread. My choice for soup is usually cornbread, but I can be persuaded to eat a piece of lovely French bread. That is just something so comforting about soup when the weather outside is disagreeable, as it has been here lately. We are having some cold nights. A grilled cheese is the perfect accompaniment to tomato soup. Like a Ham sandwich is perfect for white bean soup. Yum! That soup looks and sounds amazing. Can’t wait to try it. I have a tip for you — you should always use whole milk in tomato soup. 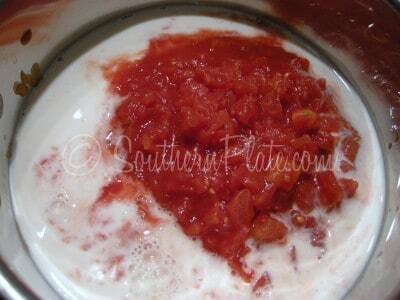 The fat in the milk helps prevent the acid in the tomatoes from curdling the soup. 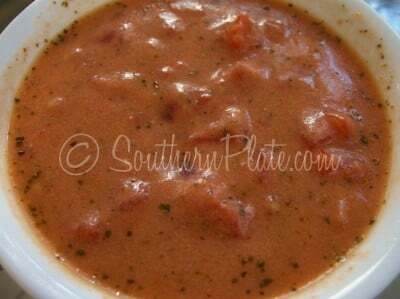 Believe me when I say there is nothing worse than curdled tomato soup. Blech! Thanks Christy this looks wonderfully delicious!!! I have three great friends from the mountain!!!! 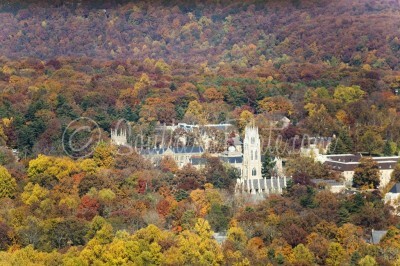 Christy, I live just about 90 minutes from Sewanee and you are right in saying it is beautiful! Gorgeous building on the University of the South’s campus too. My son has a friend who attends college there. Thanks for sharing your memories with us. This story makes me want to travel south, not necessarily to Tennessee, but anywhere away from all the snow we’re getting here in Ohio!! The soup looks great! I’m going to try that tonight with a grilled cheese sandwich. Any other soup recipes hiding up you sleeve? My hubby works outside all day, so I keep stews or chili in the fridge ay all times during the winter months.